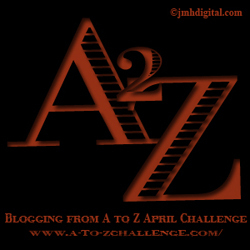 This April We’re Blogging from A to Z! Is there a better way to kick-off our new blog than with an awesome blog challenge? * We don’t think so! When Katie came across the “Blogging from A to Z Challenge“, we knew we found the one. The premise is simple: Each day of the month is assigned a letter (excluding the Sundays after April 1st) and we are challenged to write about a topic that begins with that letter. When we signed up for the challenge, we also signed up to be part of a “blog hop”, where members “hop” around to the different blogs participating in the challenge. It’s a community-oriented means of generating blog traffic and connecting with fellow bloggers. So hello fellow bloggers! Leave a comment and let us know you stopped by! Wish us luck! And check back for a flood of new content coming SOON! *We suppose a better way would be with a huge party, lots of free-flowing Moscato and chocolate cheesecake, Rick Springfield on the stage, and Colin Firth and Hugh Jackman fighting over who got to dance with us first. But we’re realists. « Five on Friday: Hooray for Weekends! Good to have you with us for the April Challenge. Have a great time with it. You’ll be linked to in this week’s Sunday Summary. Hi there – I’m visiting from the A-Z Challenge. Only 1 week left to the challenge – good luck fellow A-Z’ers! Thank you! I think this will be fun 🙂 Good luck to you!